Morris Plains Rotary Club sponsored an essay contest for the fourth graders of Morris Plains schools. Each child was asked to write about citizenship, the essays were read and the winners were selected: Katie Flanagan and Aiden O’Neill were the winners from the Borough School and Jessica Zebick was the winner from St. Virgil Academy. Committee person LouAnn Fellers presented each child with a $50 gift card after their essays were read at the Rotary Club meeting on Friday, June 12. Congratulations to all the winners! 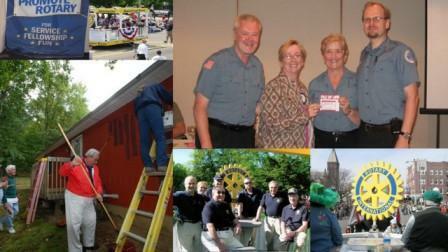 The Rotary Club of Morris Plains was founded in 1973 to serve Morris Plains and Morris Township. Today we are comprised of over 60 members—men and women who want to make a difference in their community. The mission of Rotary is to provide service to others on a local, regional and international level. Membership in Rotary is open to men and women who work or reside in the area where the club is based. The Morris Plains Rotary Club meets for breakfast at the Il Villaggio Restaurant, 22 Gibraltar Drive, Morris Plains, each Friday morning at 7:47 AM. Members and guests socialize, eat a buffet breakfast, learn about upcoming activities and events, and hear an interesting program by a guest presenter. Everyone is off to work or play by 9 AM. We invite you to join us at our weekly breakfast meeting and see what we are all about. In the meantime, please visit and explore our website to learn more about our Club. The Morris Minute Men is a non-profit, all-volunteer organization providing free emergency medical services to Morris Township and Morris Plains, New Jersey. Contact the Morris Minute Men and prepare a File of Life. List your medications, allergies and other critical information that would be useful in an emergency.